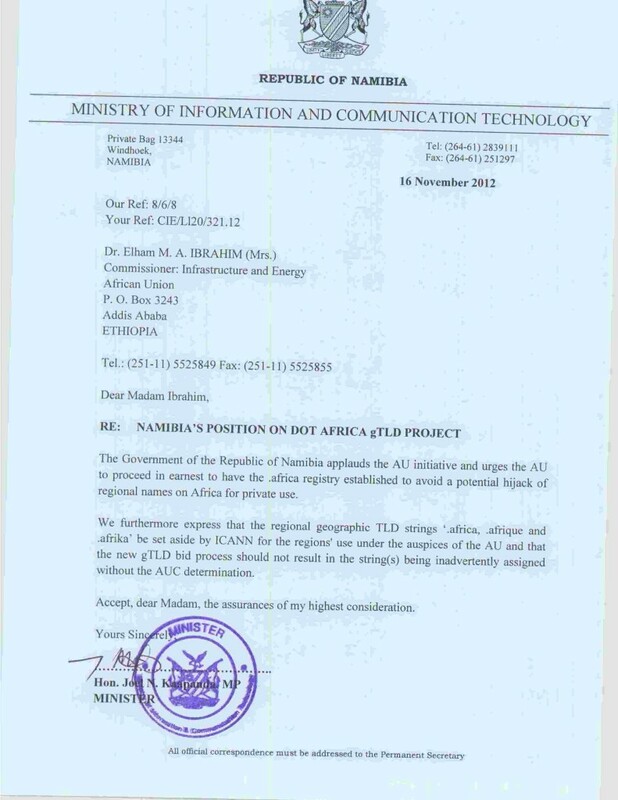 Following the article written on Kenya’s position being ignored at GAC, the former Vice chair at GAC Ms. Alice Munyua has reportedly forwarded a 12th April 2012,a letter that was written by Kenya Minister of ICT Mr. Samuel Poghisio as defense. However the contents of the letter that have been forwarded are essentially an extension of the various declarations on ICT in Africa that are now being used to validate the support of African Union, and it does not provide any support nor acknowledge Uniforum. Alice Munyua, the prior Kenyan GAC representative, who is believed to be behind the entire process of obtaining endorsements and crafting positions for the AU/Uniforum bid is also among The Steering Committee (SteerCom) of the Uniforum .Africa Team and a keen supporter of Uniforum, therefore her advice to the GAC could be said to be in the best interest of Uniforum rather than the African continent. 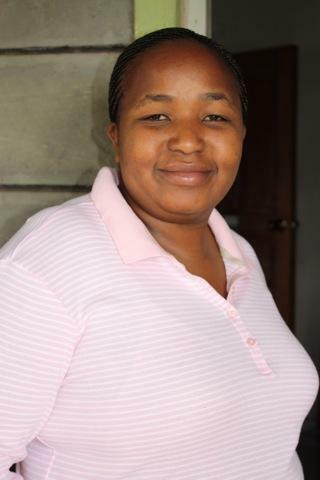 Her consistent angling for support as a good resource person has been seen as a potential benefit to the Uniforum team. Following the Declaration of the African Union Heads of State Summit Held in February 2010 in Addis Ababa and the recommendation of the African Union Conference of Ministers in Charge of Communication and Information Technologies (CITMC) held in Johannesburg in 2009 and Abuja in 2010 respectively to carry out the steps to secure resources including Dot Africa TLD, the AU initiated a processes to secure the Dot Africa TLD for regional purposes. The Government of Kenya, having supported the Heads of State Declaration and the Ministerial recommendations, applauds the AU initiative and urges the AU to proceed in earnest to have the dot Africa registry established. Kenya, furthermore expresses that the regional geographic TLD strings Dot Africa, Dot Afrique and Dot Afrika be set aside by ICANN for the regions’ use under the auspices of the African Union and that the new gTLD bid process should not result in the string(s) being inadvertently assigned without the African Union Commission (AUC) determination. The African states had signed a memorandum to support the development of the ICT industry but this once has been taken as a literal way to marshal umbrella support for an organization that was later unveiled after intense lobbying and an RFP that was tailored to suit Uniforum. 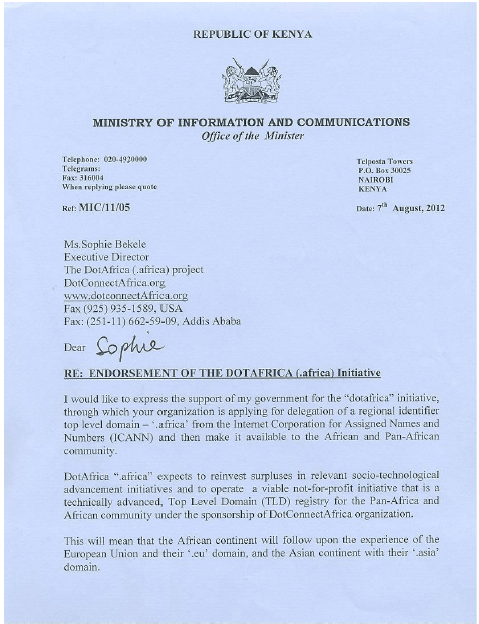 His letter copied below comes almost four months after the Dakar Ministerial meeting and may show a turnaround of sorts after the failure of the ‘reserve names clarion call” to ICANN. The supporters of the Uniforum’s .africa applicant have managed to lobby for support from every meeting including IGF meetings like the Baku UN meeting. The ‘Private use’ in this case has not been explained as the said organization DotConnectAfrica has put in its application the intent to reserve all names of known organizations that includes sovereign governments in a list that will be available to the said institutions and this will happen during the Sunrise Phase ostensibly to protect intellectual property rights holders. Note also DotConnectAfrica is a non profit that is expected to be managed as a Trust with Board of Directors similar to the IP addressing organization AfriNic. One would think why the African Governments will not rally against AfriNic accusing them of “private use” of an African “public resource”. This is because the same African ccTLDs that have objected DCA’s application are expecting to benefit from a .africa model and participants and beneficiaries of the AU RFP. The continued reference to the “potential abuse” is intended to trigger a notion that DotConnectAfrica would use the registry for its private purposes but the initiators also forget that Uniforum did not apply for a community TLD but effectively submitted a standard application not absolutely differentiated from the DotConnectAfrica application which means both organizations have the same application to ICANN. The continued misunderstanding of the ICANN process in Africa would do so much as to confuse the application process as well as the facts. It is now clear that African governments will have to take a new opportunity to place the facts properly in order to avoid a WCIT kind of scenario where African delegates were being herded to sign a treaty they did not well comprehend. The same issue has been reflected in the article by Rebecca Wanjiku who commenting on our previous blog saying “but the African Union team and the other African countries attending were not happy with the embarrassment they suffered in the presence of other global internet leaders, who have been gripped by the soap opera that is .africa application. Other African countries started wondering what was wrong with Kenya and its chameleon antics, some went ahead to spell down the genesis of the African Union position,” Rebecca is a journalist that has previously served as a steercom member of AU/Uniform bid along side Ms. Munyua and have both been effective in their support for the Uniforum team. “It was clear though that the most impacting factor in AfTLD’s bid was what the AUC would want from .Africa. AfTLD clearly supported the view that the AU is the custodian of the name “Africa” and should play a decisive role in determining how best to implement .Africa. “Unfortunately, the AUC never came forward clearly until the last minute. May be this was an unintended stroke of genius on the AUC’s part, as its RFP was very decisive and imposed a community-owned and backed .Africa” said Mpisane. There is therefore more of a tyranny in AU’s participation in the project and a status in which all countries would be put in one box and no other dissenting opinion would be tolerated, quite an embarrassing feature in the way Africa would want to handle continental matters. According to the Principle 2 of GAC’s ARTICLE I ,“The GAC shall provide advice and communicate issues and views to the ICANN Board. The GAC is not a decision making body. Such advice given by the GAC shall be without prejudice to the responsibilities of any public authority with regard to the bodies and activities of ICANN, including the Supporting Organisations and Councils”. 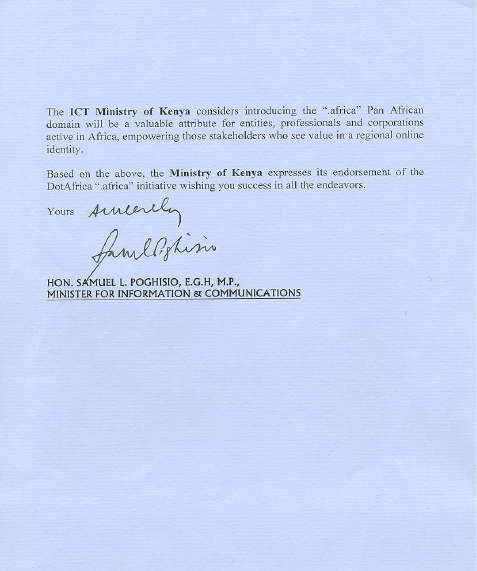 This means that the Kenyan representatives in their action have given their legitimate and honest opinions as regards to the applications submitted to ICANN. Mr Buruchara and Mr. Katundu’s opinions should be totally acceptable and ought to have been taken into consideration despite the dissenting voices that had alignment and loyalty elsewhere. They therefore cannot be crucified nor victimised for not agreeing otherwise. The African .africa circus looks as though it will not end soon unless the issues of legitimacy, corruption that have characterized the progress of the African gTLD. What is becoming clear is that governments have not developed their proper negotiating state for the ICANN process and that it has been left for a few individuals perceived to understand the ICANN process to peddle decisions on ‘behalf’ of governments who will develop cold feet.